Nagios Core allows you to enable predictive dependency checks for hosts and services to ensure that the dependency logic will have the most up-to-date status information when it comes to making decisions about whether to send out notifications or allow active checks of a host or service. The image below shows a basic diagram of hosts that are being monitored by Nagios Core, along with their parent/child relationships and dependencies. The Switch2 host in this example has just changed state from an UP state to a problem state. 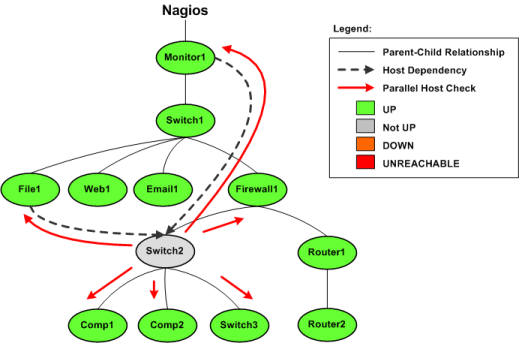 Nagios Core needs to determine whether the host is DOWN or UNREACHABLE, so it will launch parallel checks of Switch2's immediate parents (Firewall1) and children (Comp1, Comp2, and Switch3). This is a normal function of the host reachability logic. You will also notice that Switch2 is depending on Monitor1 and File1 for either notifications or check execution (which one is unimportant in this example). 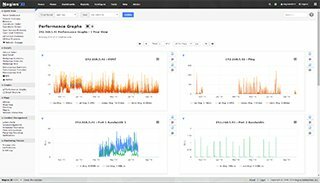 If predictive host dependency checks are enabled, Nagios Core will launch parallel checks of Monitor1 and File1 at the same time it launches checks of Switch2's immediate parents and children. Nagios Core does this because it knows that it will have to test the dependency logic in the near future (e.g. for purposes of notification) and it wants to make sure it has the most current status information for the hosts that take part in the dependency. That's how predictive dependency checks work.